We love dessert as much as anyone, but sometimes we don’t have time to make anything too complicated. One easy, fun option that is a hit in our family is thumbprint cookies. 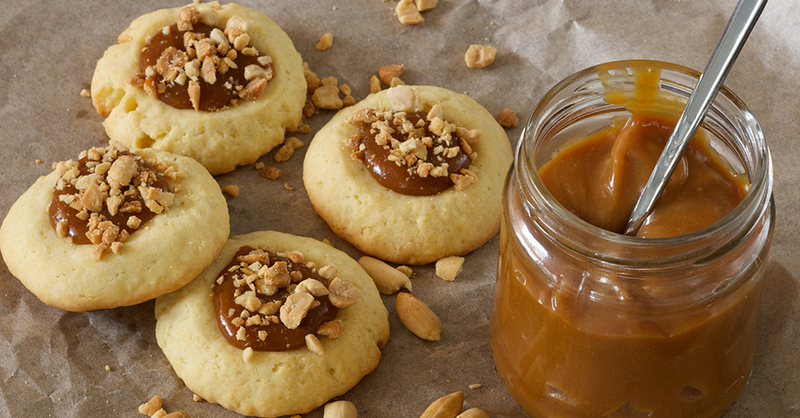 While thumbprint cookies traditionally contain jam, we decided to switch things up a bit by using caramel and peanuts instead. The sweet and salty combo from the caramel and peanuts is absolutely perfect. If you end up baking these cookies for guests, you might want to make extra for yourself, as anyone who enjoys peanuts or caramel is sure to gobble these up! Combine flour and sugar in a large mixing bowl or mixer, then beat in the butter and vanilla extract on medium speed. Knead dough and shape it into 1-inch balls. Place balls 2 inches apart on an ungreased cookie sheet, and indent each with your thumb. Bake cookies for 12-14 minutes or until the edges turn light brown. Cool for 5 minutes on the cookie sheet, then transfer to a wire rack to cool completely. Combine the heavy cream and caramels in a small heavy saucepan. Stir the mixture over low heat until the caramels are melted and smooth. Place about 1 teaspoon of the caramel into each cookie indentation. Add sea salt and chopped peanuts on top of the caramel. Let cookies sit for 5-10 minutes, or until caramel is set. Enjoy!